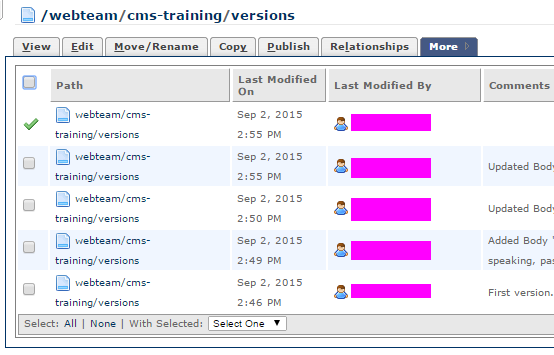 One option when editing a page in the CMS is to use versions. Versions are, simply speaking, past submitted versions of a page. Drafts are not saved as versions, but each time a page is submitted a version is saved whether or not it is published. If a page was changed drastically, and needs to be reverted to its previous state, using a previous version is the easiest way to go about that. To access a page's versions, go to the tabs at the top of the page and click "More". Within the menu that drops down, the bottom option is Versions. The versions page lists all submitted versions of a page, along with the time it was submitted and a brief description of what was changed between that version and the previous one. On the versions page, you can check and select any version but the current one. Selected versions can be deleted with the options at the bottom of the page. If you click on the path of a version, you will be taken to a preview of that version of the page. As it is a preview, it cannot be edited. At the top, there is a version menu with options to switch to the next newest or oldest version, or jump to the current version. If you jump to the current version, the versions menu disappears, and you return to the normal page. The version menu also contains the option to delete the version currently displayed, and to activate it. If you activate a version, it becomes the current viewable and editable version of the page. If you activate an old version, you must re-publish the page for it to appear on the website. The final option of the version menu is to compare the version you are looking at to the current version. When you do this, it generates a preview of the two pages combined, with all differences highlighted.